Granny’s Garden School is a 501(c)3 nonprofit organization based in Loveland, Ohio. For nearly fifteen years we have been providing outdoor educational experiences to children in Loveland and neighboring school districts. Our mission is to develop, promote, and support hands-on learning opportunities for children through garden- and nature-focused programs in partnership with local educators. GGS volunteers build and maintain school gardens and nature trails. Paid and volunteer garden educators work in partnership with classroom teachers to provide hands-on outdoor lessons based on GGS curricula that is used in school garden programs throughout the country. These experiences enhance and deepen in-classroom experiences while building life skills and connecting young minds to their natural world. Megan Gambrill, President. Megan has been a professional market grower for the decade that she has been in Cincinnati. Now living down the street from LES/LPS, she hopes that her 2 year-old will have similar wonderful garden education experiences with GGS as so many children did before. She also serves on the board of Cultivate! Ohio Valley and formerly served on the board of Slow Food Cincinnati. Laurie Flanagan, Vice President. A 22-year Loveland resident, Laurie has three children who all grew through their experiences with GGS. She believes in the importance of outdoor education, good nutrition, wellness, and lifelong exercise. In addition to her work with GGS, she is active with the Alzheimer’s Association, Loveland Athletic Boosters, and Walnut Hills Soup Kitchen. After a long career with P&G, she is currently an HR consultant specializing in leadership development and learning. Angela Myers, Treasurer. Angela is passionate about animals, children, and the environment, and strives to do her part to make the world a little better than she found it. Today, aside from her work with GGS, she is involved with the Loveland Sustainability Council, Green Umbrella, and the Greater Cincinnati Green Business Council. During the day she is the Director, Strategic Sourcing, at the E.W. Scripps Company. Melanie Simon, Plant Sale. Another longtime resident of Loveland, Melanie’s son went through the Granny’s Program at LPS and LES. She has been a volunteer for many years and is committed to the local food movement. She wears a number of hats for GGS, from helping with the plant sale to managing summer harvest programs. She also serves on the board of the Cincinnati Eosinophilic Family Coalition. Roberta Paolo, Granny Emeritus. Roberta is the founder of Granny’s Garden School. When her grandchildren were young, they spent most of their time together in the gardens. When they were in first and second grade, she wanted to extend that experience by starting a garden at their Loveland, Ohio school. The original goal was simply to give other children the chance to pick flowers. 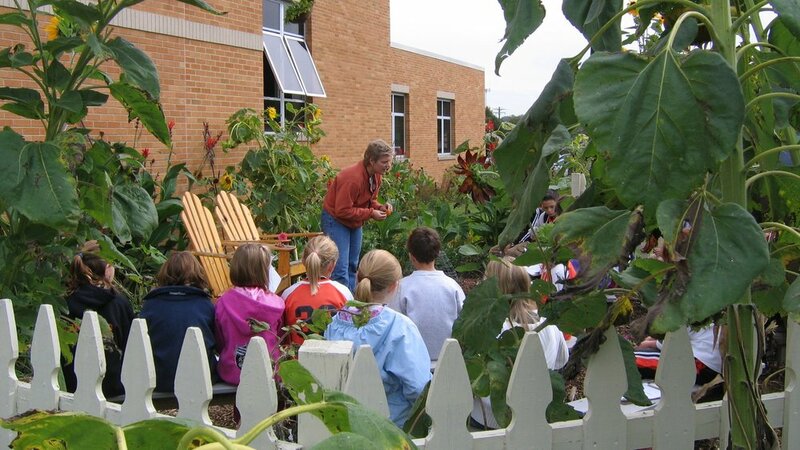 GGS took on a life of its own and grew to be one of the largest and most comprehensive school garden education programs in the country. Though she is retired from GGS, Roberta continues to provide guidance to school garden programs through her website.